The mouth-watering taste of beef will satisfy the heartiest of appetites. This pâté-style loaf with beef provides complete, balanced nutrition and a source of moisture that can be beneficial to small dogs. Gram-for-gram, wet foods like the CESAR® brand have fewer calories than dry food. Paired with CESAR® Dry food, the 100g serving makes a perfect meal for small dogs. 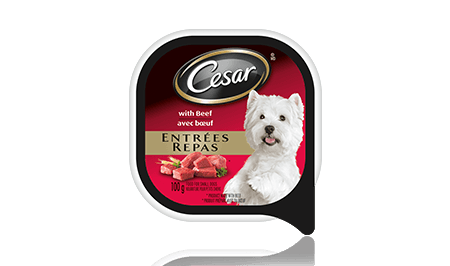 CESAR® ENTRÉES: WITH BEEF 100g is rated 4.5 out of 5 by 46. Rated 5 out of 5 by JACKIESON_3551403890 from My dog loved Cesar entrees with beef and pawed the cupboard for more! It smelled good, even by human standards. It comes in a convenient small package, so it's easy to take for camping when we don't want to store the large opened cans in the cooler. It will also be our first choice when we go away and leave her at a friend's for a weekend to combat her mild separation anxiety - she can't resist and will break her hunger strike. However, it is quite expensive and does not fit in with our dog budget, so for this reason we won't buy it regularly. Rated 5 out of 5 by DONNAGON_3551410550 from One of our dogs is a very picky eater so we put wet food on top of her kibble so she'll eat it. She won't eat the kibble without the wet food on top. We've always used another brand without issue, but when offered to try Cesar's, we decided to give it a go and try her on something different hoping she would enjoy it. It looked yummy out of the container. We put in on her kibble and she instantly took to it and gobbled it right up. She loved it. From now on, our little girl is a Cesar's girl. Rated 4 out of 5 by ROSALINELAB_3551404980 from My dog loved this product, however I was a little turned off to see a huge chunk or artery or vein in the middle of the pkg. I realise that this is a meat product and very likely is automatically chopped, but, I do not want to give chunks of blood vessel or intestine to my dog.. For this reason I am still going to feed my dog Cesar slices with his kibble. Rated 5 out of 5 by SAMANTHACON_3551414973 from My dog had dental surgery and needed to have soft foods for a few a days. Unfortunately she's extremely picky so it was hard to get her to eat anything. She loved this stuff.... woofed it right down and luckily had no gastrointestinal issue after. Now I just give her some for a nice treat. Rated 5 out of 5 by SANDYMNS_3551408445 from My dog loved this product. He gobbled it up quickly and was looking for more. The serving size for him is the perfect size and the packaging is very convenient. I will be buying this again and I will tell my friends about it as well. Thanks for the sample and the chance to try it!!! Rated 5 out of 5 by JOECNS_3551405864 from Not having tried it myself, I yield to my dogs expert palate. She is very selective yet really enjoys the Cesar Entrees. I'm not sure if its the texture or flavour of the Entree meal, but she wont eat the Slices yet devours the Entree which is a little firmer in texture. CESAR® Entrées With Beef Food For Small Dogs is formulated to meet the nutritional levels established by the AAFCO Dog Food Nutrient Profiles for maintenance.